Creating works of art is a mysterious process. In that process no less mysterious paradoxical objects, hardly reducible to mathematical formulas, are produced. In principle, every work of art is inexhaustible, since it represents a cosmos of feelings and thoughts in their unity. But, it is possible and important to study its separate formalized parts. Namely a rational study allows us to try to reveal and reach down the over-rational depths of the works of art. As artist, I am interested in emerging and developing forms. The subjective factor is reduced to minimum. In this case, the artistic form is reduced to a meaning - a visual image of the invisible. That condensation of the meaning results in the dematerialization of the form - it becomes an act of conscience. As a result emerges a plastic system, following Malevich's system and existing as parallel with it. The interaction of such two systems produces an energy field - the space for a new work of art. 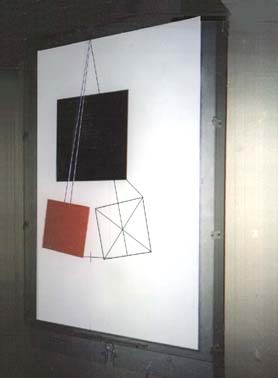 The (animated) installation represents the process of active, creative perception of a work of art - the suprematic drawing by Malevich (see above) made about 1920. 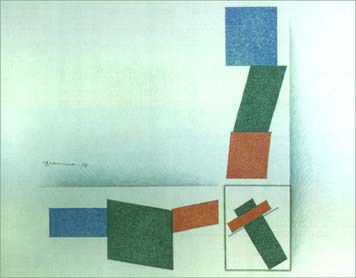 It illustrates the transition from Malevichs two-dimensional drawing to our three-dimensional space (i.e. 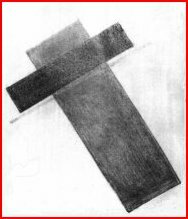 the way from the "flat space of Malevich" to our real space). For the original plane structure, this is a new mode of existence. In a physical sense, for an object depicted on a surface there is only one point from which the composition can be observed. Now the number of such view points increases to infinity, but among them there is only one from which a view of the three-dimensional object coincides with that one shown by two-dimensional picture. A. Pankin. "A Sweep of the Structure by Malevich." paper, pencil, 60x80 cm. A. Pankin. "Proportional system." A. Pankin. 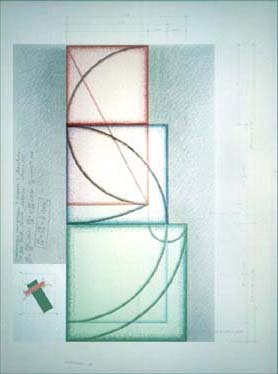 "Three projections of the structure" 1997, paper, pencil, 60×80 cm. 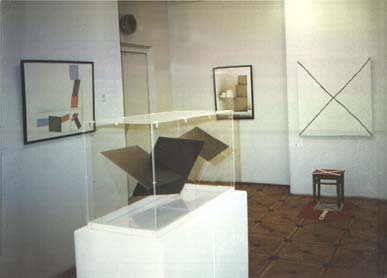 1997, paper, pencil, 80×60 cm. 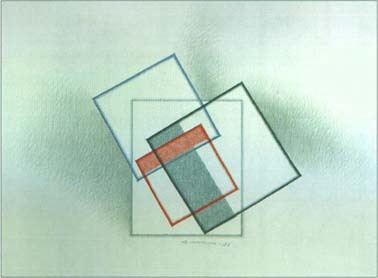 "beeng" of a "Structure by Malevich" in three-dimensional space. Canvas, oil, 71.1 x 44.4 cm. Canvas, plastic, oil, 83 x 51 x 12 cm.